As overlanders, hikers, backpackers, fisher(wo)men, surfers, mountain bikers, and general outdoor enthusiasts, we believe taking care of one's playground is critical. We understand the irony of renting four-wheel drive vehicles and simultaneously touting conservation efforts. However, we do not feel that these are mutually exclusive. By helping people get outside and experience nature we hope they will gain a greater appreciation for the wilderness that surrounds us and be more committed to protecting it. Read on for tips on how to stay safe, travel prepared and leave as little of an impact on the natural environment as you can. After all, we love getting outside because of the natural beauty, peace and quiet and lack of human footprint, so let's protect where we play. 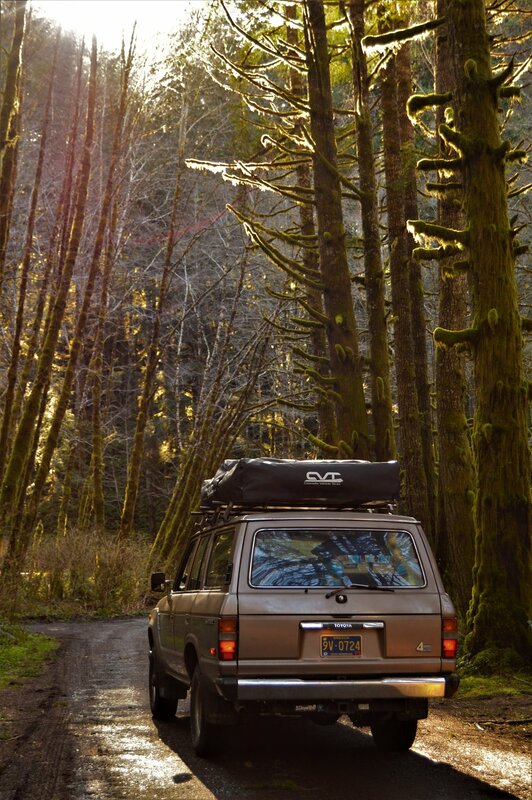 Being prepared and traveling when conditions are appropriate means you are more far more likely to make your journey safely and lessen your impact on the environment, by avoiding tearing up trails unnecessarily, mechanical failures that result in releasing automotive fluids into the environment, or having to camp where you shouldn't. Always check road and weather conditions prior to taking off on any trip, especially if you will be going into the backcountry. Also check for other hazardous conditions such as fire, floods, mudslides, etc. Make sure you have the appropriate gear to get you where you need to go, and get you out of a sticky situation. Some basic recovery and safety gear to consider brining if you're going off the beaten path: jack, tow straps, shovel, air compressor, tire repair kit, emergency beacon, and maybe a good 'ol fashioned paper map. Before going off the grid, make sure to fill up on gas, water, and food. You should have at least one gallon of water per person per day on board and enough gas to get you where you're going and back, and then some. Always tell someone where you're planning on going, and provided them with a detailed itinerary and check-in often, especially if your plans change. We recommend a Spot or other remote location device if going out of service area for more than a day or two. Part of what we love about the outdoors is the solitude. Dispersed camping provides a primitive experience of camping away from developed campgrounds and other campers. Usually this type of camping means there are no: toilets, picnic tables, trash cans, potable water, or fire grates. There are extra responsibilities and skills necessary for dispersed camping. It's your responsibility to know these before you go. There are some good apps that work offline that will provide you the boundaries of these lands at your fingertips. They can be really handy if you're not sure exactly where you want to camp or if you're traveling in an area you are unfamiliar with. Some of our favorites include: US public lands and OnX. Don't forget your Gazetteer! Pack it in, pack it out. Inspect your campsite and rest areas for trash or spilled foods. Deflate the air in your tires when leaving a maintained road. This not only increases the vehicle’s capability, it reduces environmental impact by reducing unnecessary wheel spin. Cross streams only at designated fording points. As a company, Wonderland Expeditions is a member of Leave No Trace, 1% For The Planet and The Conservation Alliance, where we donate a portion of our annual profits to help further environmental protection work. We encourage others to give back any way they can. Whether it be donating to a good cause, volunteering, or simply picking up after others when in the outdoors. There are a number of ways to give back, and no act is too small.